I remember Albert Schweitzer, but only slightly, for I was only 7 yrs. old when my brother mentioned him. Recently, I came across an old Life magazine article about Schweitzer, whose photo was as unforgettable as Einstein’s. He lived from 1875 to 1965, earned a Nobel Peace Prize in 1952 for his work as a doctor and founding a hospital, saving lives and bringing medicine to native Africans. But most of all, at my young age, I remember what he said about ending suffering, which he regarded as evil. End suffering? 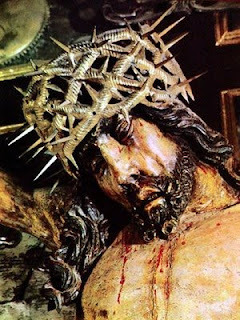 Suffering is “evil?” Being raised as a Catholic, with the hanging corpse present in our home and our church of a man who died in agony, a symbol, we were taught, of a redemption from eternal suffering because of this, the message was, “Look, Jesus did it for you. He set the example. Look how much he loves you!” But the message really is: IT IS GOOD TO SUFFER. The central teaching of Christianity is NOT the life of Jesus, but the sufferings and death of Christ. (And, in case you didn’t know this already, crucifixion was one of the cruelest methods of punishment, as the victim typically suffered for hours in agony before succumbing. So, the crueler the better.) Since Jesus was THE example of ultimate love, we mere mortals could never argue against Jesus’ wonderful obedience and resignation to his father’s will, could we now? Even if this father had forsaken him and ignored his final pleading. It was all about the will of God; the will of a sadist and the acceptance of masochists. And, perversely, the punishment for “sin” (suffering) was contorted to become something positive and meritorious in itself - became the drug of choice for the faithful. Vast numbers of sermons and theological arguments have been written to explain why God allows and even prefers humans to suffer for the greater good, to include anyone who loves or cares about the sufferer. And, as if there was not enough suffering to deal with in this world already, believers are asked, even commanded, to make themselves and others suffer by their own hands, for penance, redemption, blessings, etc., etc. Think about it. When we speak of the OT genocides, the Flood, martyrs of all faiths, deaths of mothers and infants in childbirths, circumcisions, female genital mutilation, the trials of Job, we refer to them only and not to the agonies or sufferings of those who helplessly, hopelessly, watch those loved ones suffer or die. We must conclude that if there is a biblical deity, the evidence shows he is a sadist forever and ever, through and through. We must conclude that if there is a biblical deity, the evidence shows he is a sadist forever and ever, through and through.Sanctioning the sufferings of others, with the write-off that they are God’s unquestionable will, and therefore good, is immoral and inhumane, reflecting an indifference to suffering. To accept suffering as the result of nature, and to manipulate nature to end suffering, is moral. Nature is indifferent to us and this is acceptable, but this God want us to suffer, and that is not acceptable. It’s interesting to contrast the attitudes and actions of Dr. Schweitzer and another Nobel Peace Prize recipient (1979), Mother Teresa. Both were Christians, one a humanitarian (Schweitzer), the other a strict Catholic. Teresa saw suffering as holy, God’s will, and, though she did relieve it, she did not free up the millions in donations meant to end the suffering as much as possible. She also was against birth control, thus sanctioning bringing more children into a life of deprivation and suffering. Schweitzer dedicated his life to end the “evil” of suffering. That person who jumps into the river to save a drowning child is greater than God. Time to take the crucifixes down and burn them, to warm the cold people. The creed of suffering is sick.